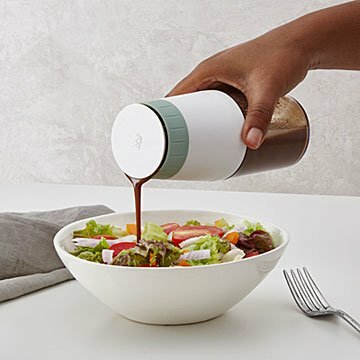 Prep, shake, pour, and store homemade salad dressing in one container, saving steps and cleaning time. Dress up greens and give pasta salads your signature zip with this elegant prep tool that mixes, pours, and stores. It's easy to shake up your greens routine by blending your own dressings. Simply add flavoring ingredients—herbs, spices, garlic, ginger, fruit, etc.—to the clear cup. Pour in olive oil and vinegar. Then screw the top half on. In a few shakes you'll have a delectable dressing, dip, or marinade. Elegant enough to bring to the table, and airtight enough to store what's leftover in the fridge. Both experienced and novice cooks will appreciate this step-saving solution. Designed in Denmark. Made in China. 6.4" H x 2.7" Dia.